People often ask us if we miss the US/California, or if we feel homesick. My usual response is that while we haven't been away long enough to really miss it (and while we're still having too much fun getting to know this place), we do miss certain things. Aside from the obvious - my family and our friends - we miss certain things that were a big part of our lives, some of which you just can't really find here in Bratislava. Here is a list of some of the things we miss the most. For us, Thai food is a staple. For me, it's been the bryndzove haluski or pork with dumplings of my diet for eons. Yes, Terezia makes an awesome green curry chicken with pumpkin. 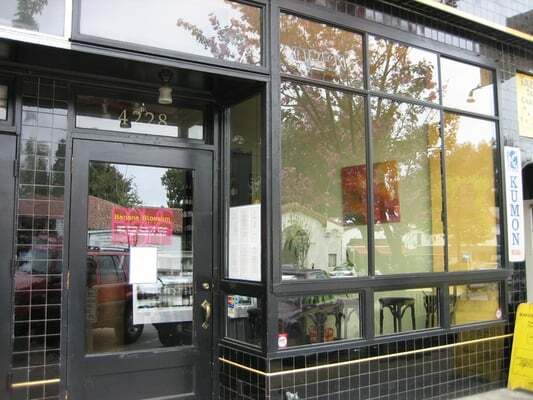 But we both really miss the Thai place - Banana Blossom - that was a block away from our apartment in Oakland. At times we go into heavy withdrawals dreaming about their orgasmically rich, complex massaman curry with chicken, their sublimely delicious spicy crab noodles, and their tasty and refreshing papaya salad. We really miss going to this place on a Friday night and unwinding with a bowl of their spicy curry. And I miss Thai iced tea. None of the Thai restaurants we've been to in Central Europe even offer it, which to me is tantamount to a Slovak restaurant not having any beer. Plus, the only Thai restaurant in Bratislava is pretty terrible and ridiculously overpriced to boot. (Update - a new Thai-ish restaurant has recently opened up in the center of the Old Town. We'll have to try it and report back). Banana Blossom - our favorite Thai place in Oakland. 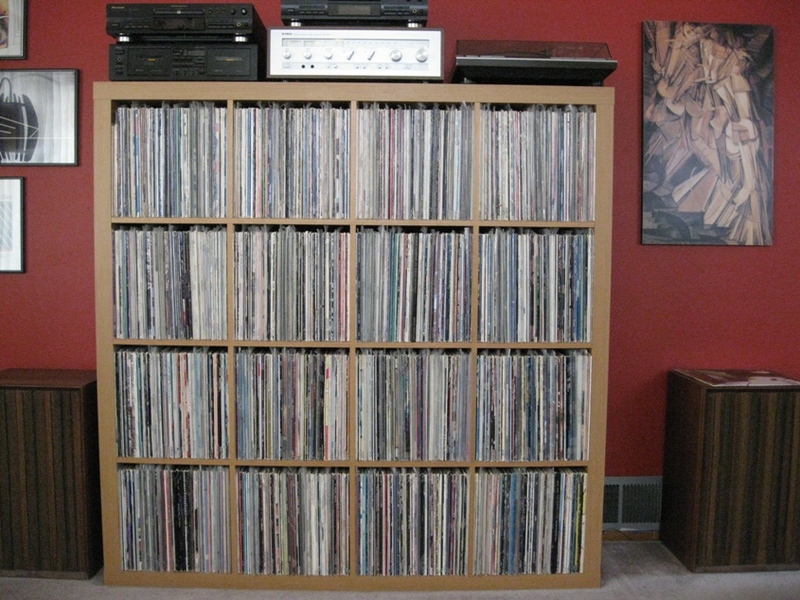 Although I digitized a large portion of my collection before moving, so I at least have the music with me, I still miss my record collection. I miss flipping though the LPs, pulling them out, gazing at the covers, carefully removing the records from the sleeves and putting them on the turntable and listening to them while lying on the couch. Now it's all iPod and laptop, and while that's infinitely better than nothing, I have been feeling a bit of vinyl withdrawal. 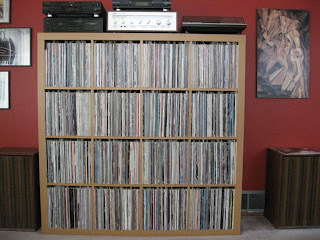 My LPs in our old apartment back in Oakland. 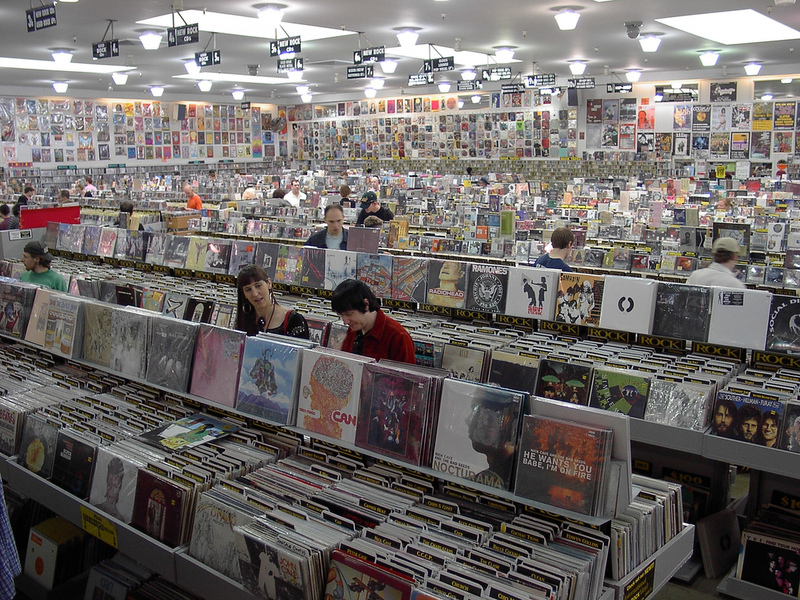 I seriously miss going to Amoeba in Berkeley every week and flipping through the used LPs, especially the racks of new arrivals. I went there far more often than any sane person should. I miss Amoeba's larger San Francisco location as well, in addition to some of the other smaller independent record shops in the Bay Area. There is a record store in Bratislava that's a mere three blocks away from where we live, and it's decent, but the guy's stock doesn't really change at all - he's had the same LPs since the first time I went there back in December (he's got a lot of prog and 80s metal, strangely enough). My only other alternative is to go to Vienna where there are a few decent shops, but nothing on par with Amoeba, and I don't make it over to Vienna so often anyhow. Amoeba's location on Telegraph Ave. in Berkeley. I haven't visited any record stores there yet). Terezia really misses the deck at our old apartment in Oakland, on which she spent many evenings relaxing, working on menus, and watching the sunset and the views of the bay. We grew numerous herbs and other things there, which we always cooked with. Terezia also misses grilling on the deck - especially grilling salmon on a cedar plank as well as flatbread. We are totally crazy for ice cream - who isn't? But we don't eat it too often so as not to expand our waistlines. That means that when we do eat it, it's a special event and we want it to be good. Sadly, most of the ice cream sold in stores like Tesco or Lidl that we've tried ranges from not very good to terrible. They have Hagen Daaz, but a pint of it costs over 7 euros! The most commonly found brand, Carte d'Oro, is really inconsistent. Some of its flavors taste chemically and have the texture of a sponge, although at least one flavor, called Caffe Latte, is okay. Ben & Jerry's is badly needed here. You can find decent ice cream at ice cream shops, though. The best is a place called Zahradna zmrzlina in Lucenec. But, of course, since it's all the way in Lucenec, we can't just hop over there any time we get a hankering for the stuff. Bratislava has a few decent places, but they're a bit pricey. (Update - our friend Chris [Ludka's boyfriend] says that he spotted a small Ben & Jerry's freezer at a Subway Sandwiches in Bratislava - we're obviously going to have to check this out). We both miss being able to walk down the street and see a Thai restaurant, an Indian joint, a Mexican place, an upscale Italian trattoria, and a sushi bar, sometimes all within a few blocks. On most Bratislava streets, you see a Slovak restaurant, and then another Slovak restaurant, followed by 4 or 5 other Slovak restaurants, and then maybe a kebab stand or two. There are a handful of Chinese restaurants, but we got burnt out on Chinese food years ago so we rarely crave it. There are a couple Vietnamese places, but the garish color photos of their dishes that are plastered all over their shopfronts look horrible and unappetizing. Pizza seems fairly easy to find in Bratislava, and one place very close to our apartment is at least decent. There are a handful of sushi restaurants, but we have not tried them yet, and I have to wonder about a sushi place in a land-locked country. We've walked past an Indian restaurant on Obchodna many times, but again, our experiences with Thai food make us a little skeptical (and I doubt it'd be anything like Vik's or Ajanta in Berkeley). We'll try it at some point, but options for non-Slovak cuisine are seriously limited compared to what we're used to in the Bay Area. And since Terezia's mom cooks excellent Slovak food when we visit her, we seldom go out to eat the stuff here in Bratislava. Part of the issue here is that Bratislava just isn't the kind of ethnically diverse melting pot that the Bay Area (or Paris or London, etc.) is, but I suspect that might change over the next few decades. Immigrants typically bring their cuisine with them as part of their overall cultural package, and it would be wonderful to see some of these things added to Bratislava's cultural stew. Vik's heavenly samosas with the rich and complex cholle sauce. I needed to take a hiatus from making music (some of you may feel it should be a permanent one! ), but now, after nearly 10 months of guitarlessness, I'm kind of wishing I'd figured out a way to bring one of my guitars over here. I could always buy one here, though, but then that costs money. It would be nice if I at least knew someone here with a guitar who'd let me play it now and then! Playing my 1967 Guild Starfire 12-string at the Make Out Room. Berkeley's Monterey Market is probably the best place to buy produce in the East Bay. Not only do they have wonderful, fresh, reasonably priced organic produce, but they have a slew of more exotic things that you just can't find in the chain stores (and always at cheaper prices than Whole Foods). For example, they have the most diverse and varied mushroom selection we've seen anywhere, and for decent prices too. Depending on the season, they'll have massive, fleshy chanterelles; wonderfully flavorful black trumpets; intensely delicious porcinis (both fresh and dried); healthy and plump shitakes; and a gazillion other varieties. They also have some of the best, most amazingly soft and sweet fresh medjool dates that you can find anywhere, and in August/September, Monterey Market is the place to buy figs, one of my favorite fruits (especially the black mission and candy stripe varieties). True, Bratislava has Mileticka, a nice and fairly large outdoor market, and while the produce is usually good quality and well priced, we never see the kind of variety or the more exotic things that we could find at Monterey Market. The closest we've found here is the sprawling Naschmarkt in Vienna, but given that it's an hour a way, we don't make it there as often as we'd like. (We also miss the Lakeshore Farmers' Market in Oakland and Berkeley Bowl for similar reasons, but Monterey Market really was the best). Part of Monterey Market's amazing mushroom selection. Terezia and I came here as often as possible. In Oakland/Berkeley, I rode to work everyday (15 miles round trip) and loved it, and I did lengthier rides on weekends whenever I had time. 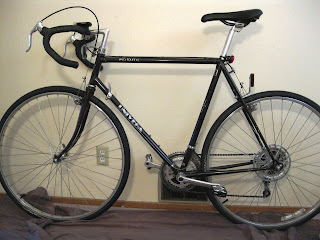 However, having been fiending to ride again, I recently broke down and bought an early 1980s 10-speed Peugeot road bike. I had it fixed up a bit and have started riding the dedicated bike paths in both directions along the Danube. It's a beautiful feeling. The Peugeot is not as nice as my Univega back home, but it will suffice for the time being. Expect a future blog post about my bike-related adventures. sounds, I really felt one with the thing. Terezia also misses her car and driving it on California's freeways, hiking through the lovely redwood tree-filled trails in the forests of the Oakland Hills, seeing films at Oakland's Grand Lake Theater, and her colleagues at her old job at the Palo Alto Elks Lodge. Soon I'll have to do a post about the things we don't miss. This was a fun blog post. Even though I am not so far removed, I often think about what I miss from California and while our lists are not identical, they have their similarities. Are you still studying Italian or focusing on the slavic languages these days? I've been studying here and have a friend to practice with, but I miss Sunday mornings at Cafe Roma with you and Joel. Ciao Aviva (or I should use the Slovak čau)! Yeah, I miss those morning at the cafe with Joel as well. I also miss classes with Anna. I remember that one class we had at her house, with you, me, Joel, and those two other people. That one was so intense, but I felt like I learned a lot. No, I'm not studying Italian, sadly, although we went to see Woody Allen's To Rome With Love here in the theater a couple weeks ago, and although it had Slovak subtitles, there are significant portions of the film where the characters are speaking only in Italian, so I was forced to rely on what I'd learned, without the benefit of English subtitles. Definitely kept me on my toes - I think I understood at least 50% of what was said, so I at least knew what was going on. But yeah, I wish I could hop over to California for just a weekend and refuel on at least a few of the things I miss. Vienna, Prague, and back to Bratislava.